€30 worth of pure luxury inside a small golden tube is perfect to brighten up the day. Simplicity with a sense of colour. You look phenomenal! Beautiful color. Oh, I love that lipstickcolour. AMAZING! Wow..that colour is perfect!! Looks so good on you. 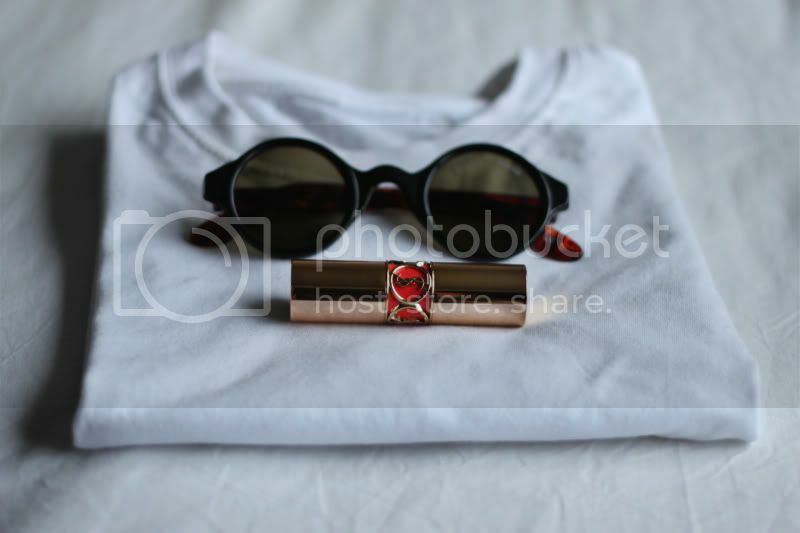 And the sunglasses are very nice too! Wow, tweede foto is stunning! You look amazing. I really love your blog. thanks for your comment on holier than now ... happy to discover your BEAUTIFUL blog. just followed you. hi!Thanks for your comment, i really love your blog, follow you, follow back???Kisses!!! alleen 30 euro is helaas wat te duur voor mij haha. die bril is echt supergaaf! Anyway, thank you very much for your opinion :) Of course I choose trends carefully and I don't wear everything, but I thoush that the global opinion influences me, if I want or not. This lipstick gives me summerfeelings! En je blog is enig! Absolutely fab! That colour (again I'm saying that) is amazing! I bought a orange and pink one from MAC and super happy. However, this colour I need to have too...by the way, I'm your latest follower! Thank you for your adorable comment. i have that lipstick too! isnt it dreamy? i cant seem to walk away from the yves saint laurent beauty stand without buying a lipstick or two, their lipsticks just glide on so smooth. you've got such a stunning style! wauw, wat een mooie kleur lippenstift! en die zonnebril is echt heel leuk. very unique glasses! cute too! God, the color is gorgeous not to mention you're terribly beautiful! Gah, that lipstick is amazing! Love! Wow this color suits U amazingly ! Love your face ! 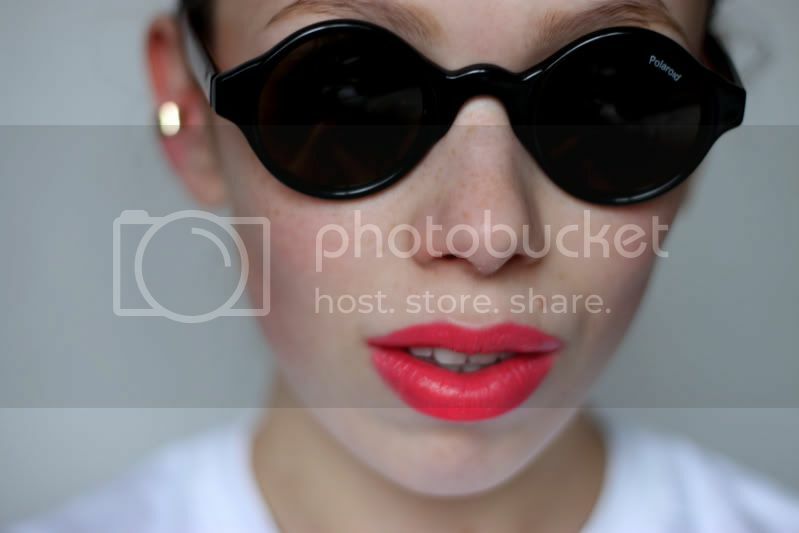 Oh the shade of that lipstick is stunning on you and the sunglasses combined with it-just very lovely. Also thank you so much for your comment. I was worried no one would want to read it! WOW! You are so beautiful on that photo. I'm speechless! Thanks for your comment on my blog, I'm going to follow you!! mag ik vragen waar je die mooie 'ear cuff' vandaag hebt? i like. give me that lipstick and your eyeballs please!! LOL. Waarom staan al die kleurtjes jou toch zo mooi?! You are beautiful in second photos! Oh that is a really nice color. You look stunning, the lipstick is wonderful! Woww, love that colour, looks lovely on you! Ahh, what course are you going to be studying at CSM in the summer? Prachtig staat je hartstikke goed! Wat een aparte oorring zeg! Mooi! Thanks to your comment on my blog I just discovered yours, I love it Ivania! You've got a new follower on bloglovin and facebook ;) Your blog title really fits to what you're posting about, amazing aesthetic photos! WOW, you have a beautiful blog and amazing style. wow, your lips are amazing! love the glasses. check out my blog "stylemaniac"
Die laatste foto is echt super! Beautiful! Love the bright pink! Loving that colour lipstick and those glasses are rocking on you woman! great color!!! i want this!! besides the fact that you are SUPER gorgeous---and im in love with your hair (I just got rid of my ombre im a little depressed) I'm even more obsessed with that lipstick!!!!! been looking for a good coral forever---and you just found one for me ;) love love!!! also, thank you soooo much for your sweet comment, means the world to me! Your glasses are so cool! 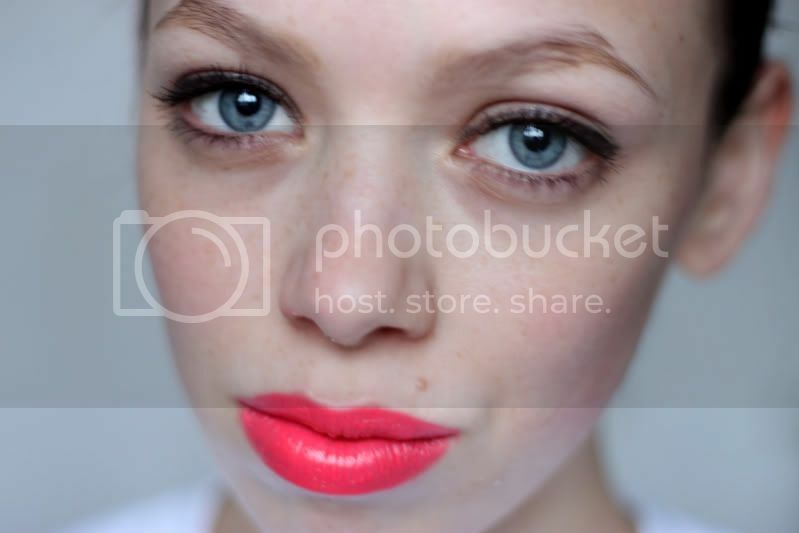 These photos could be a lipstick ad- they're really pretty!